Customers who choose a Raindance Select Showerpipe E 300 are people who live life to the fullest in terms of comfort and pleasure – and whose focus is on eye-catching design. The new shower system combines lots of different functions in a way that is both intelligent and attractive. The shower system consists of the Raindance Select overhead shower, the Raindance Select hand shower and the Ecostat Select thermostat. The showerpipe can easily be fitted onto existing wall connections – the ideal solution for upgrading a bathroom. Invigorating or relaxing rain that comes from the overhead shower, plus three different jet types from the hand shower. As well as offering a pleasurable shower experience at the touch of a button and a jet selection that is refreshingly simple, the Raindance Select Showerpipe E 300 is guaranteed to be a design highlight in the bathroom. The new Hansgrohe design, with its harmoniously rounded corners and flowing shapes, is timelessly modern and offers an extremely wide range of combination options. Another successful combination: the Raindance Select 360 Showerpipe with the larger Raindance overhead shower. Plump, pearly raindrops fall from its shoulder-wide, 360 mm spray disc and envelop your whole body. 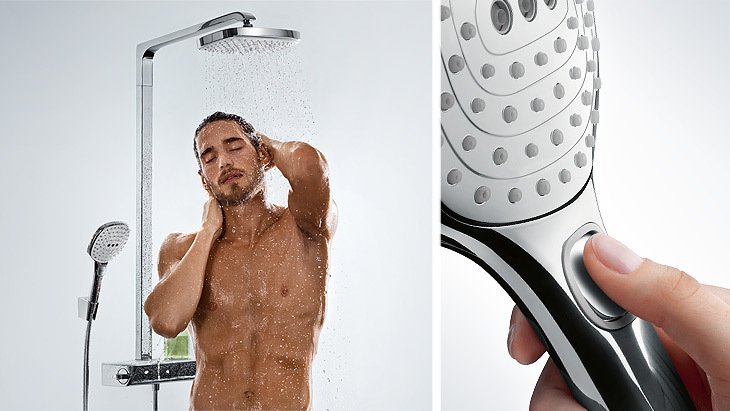 Savvy shower system featuring a little button: select the jet type in just one click.